Part I in this series, Thinking Safety, is an overview of science safety rules, supplies, and resources. Safety should be on our minds not only while doing science activities, but cooking, cleaning, crafting, gardening, car maintenance, and many other areas of home life also require safety precautions, personal protective equipment, and thought. Safety note: Be sure to explain safety precautions to children. Protection should be used for eyes, ears, skin, clothing, and fumes. Disclaimer: All information provided on this site is for entertainment and education purposes only. Using any information from thecasabouquet.com is at your own risk. 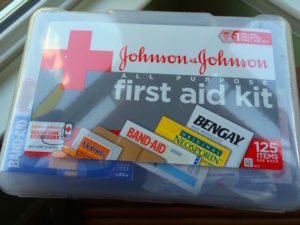 First aid supplies in a portable kit are handy for science experiments and around the home and car. The American National Standards Institute (ANSI) has issued minimum requirements for first aid kits and supplies. These include compress, bandages, antibiotic ointment, gauze, medical gloves (nitrile are best), antiseptic, burn treatment, and first aid guide. 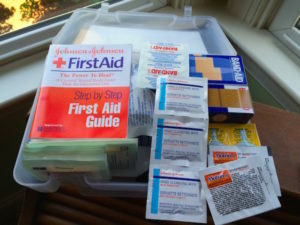 A good start is an all purpose first aid kit in a portable box. When leading activities for a group, such as camp, I have added bottles of ibuprofen and acetaminophen and a tube of triple antibiotic ointment. You may also add a box of “fun” adhesive bandages — a superhero always helps the pain! Bandages can cause skin reactions for some, so sensitive skin bandages would also be a good addition. My kit gets carried in a reusable shopping bag. The bag also has bug spray, sunscreen, and hand sanitizer. For safety glasses, alcohol wipes (60% or more alcohol) should be used to thoroughly clean between each wearing. See “4 tips for summer camp management” for parent permission forms to alert parents about your first aid supplies. I wish that homes came with built in safety equipment. An important item for the kitchen and workshop is a fire extinguisher. Get one that is multipurpose, and make sure to regularly practice its operation. A school science laboratory has to comply with OSHA regulations for the storage of chemicals and easy access to Material Safety Data Sheets (MSDS). 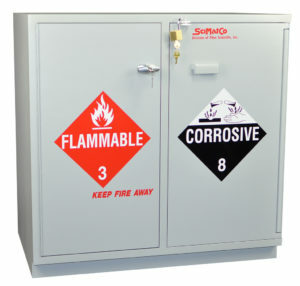 In a lab, you have acid/corrosives cabinets and flammables cabinets. Also, all chemicals are stored on labeled shelves by category. Household chemicals have MSDS and should be stored safely. I wish our homes came with safety storage! Use the Household Products Database (http://householdproducts.nlm.nih.gov/index.htm) to look up one of your favorite cleaning products and read the information. These sheets will tell you how the product should be stored, first aid, how to dispose, and warnings for handling (such as, don’t mix ammonia with bleach!). We were able to get a used cabinet to set up in our garage. At least we can keep paint, pesticides, antifreeze, and fertilizers in a safer place. Make sure you take an inventory of your garage, under sink, pantry, and laundry room and make sure all your chemicals are stored safely, labeled, and out of reach of children. 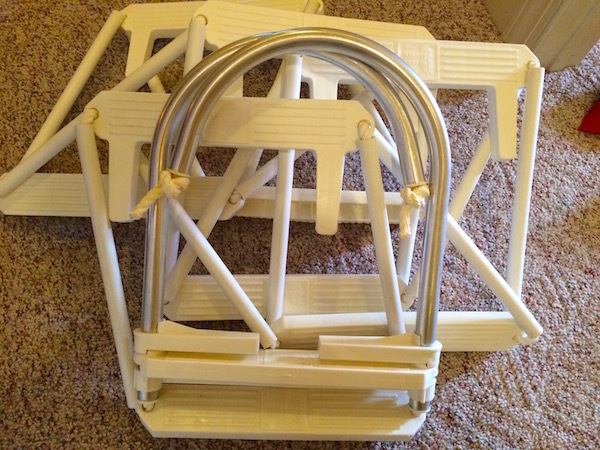 I also wish multi-story homes would come equipped with fire escape ladders. You will also need smoke and carbon monoxide detectors. Along with a first aid kit and jumper cables, you may want to add more emergency preparedness items to your car. One of my favorites to give as a gift is a car escape tool. There are several on the market and they include a light, a way to break a window, and a way to cut the seatbelt. Once you have the tool, give some thought to where to store it in the car so you can get at it in an emergency. Take some time to think about these safety tips and what needs to be practiced with your family. Be a safety hero and make safety cool for you and yours! I had the privilege a few years ago to be on the design team for the Friday Institute for Educational Innovation at NC State University. I had to do research and talk to experts about designing a lab that was safe for children and adults. I’ve been a believer ever since. The experience has inspired me to analyze safety in all areas for education activities and home. Safety counts! Excellent safety tips that we ALL need to be aware of. Thanks so much for sharing! Hey Lucie, Thanks for visiting! I’m kind of a safety geek, so I’m glad you liked my tips. I need to go get a new kitchen fire extinguisher myself! These are excellent suggestions. thank you. Thanks, Dr. Aletha. I do wish homebuilders would just include the safety cabinet and the upstairs escape ladders. And of course we all need smoke alarms and CO2 monitors! I’ll be waiting to hear what car escape tool you all end up using!